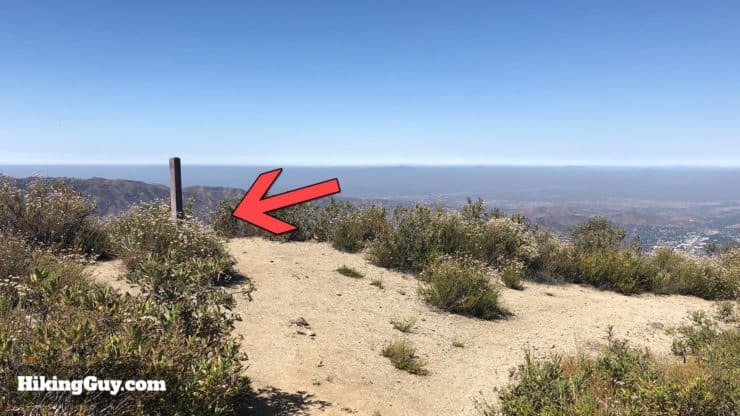 The hike to Mt Lukens, the highest point in the city of LA at 5,066 feet, is a fun one that doesn’t get as much traffic as other more popular Southern California hikes. 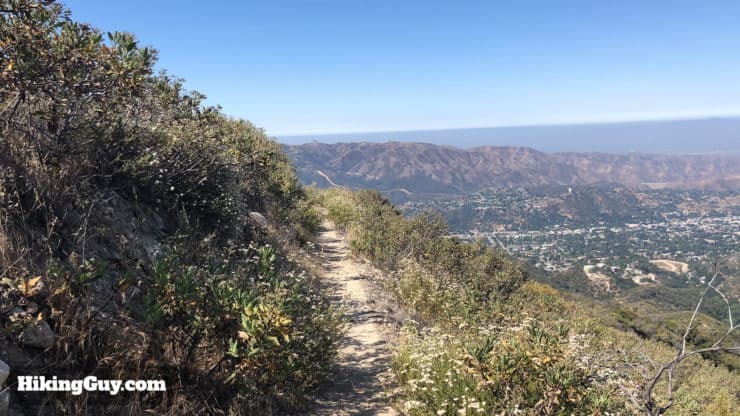 It’s a tough 10 mile loop with almost 3,000 feet of total ascent, and you’re rewarded with great views and pristine wilderness, all within the city of LA. 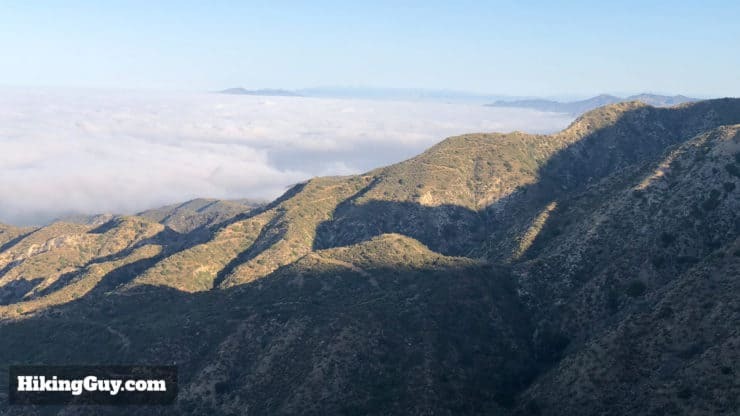 Mt Lukens is the westernmost peak of the San Gabriel Mountains front range. 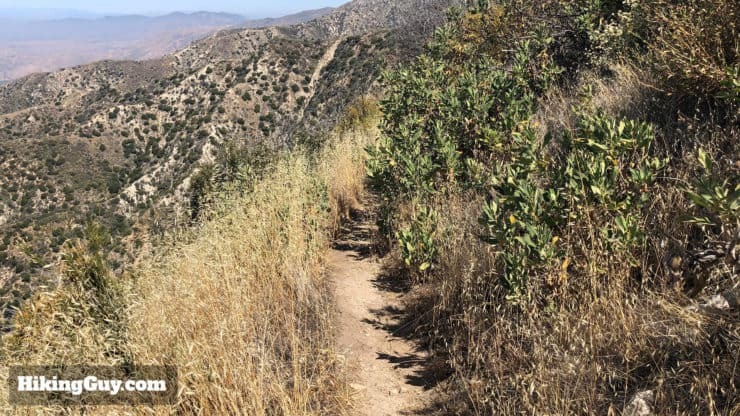 Hiking to the peak gives you a glimpse into the mountainous innards of Angeles National Forest. Looking back to the west you have about 3,000 feet of prominence, with terrific views of LA and the Verdugo Mountains. 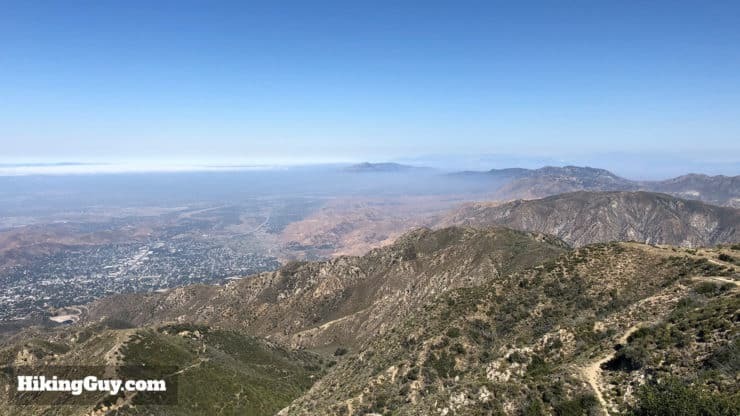 On a clear day you can see from Catalina to San Gorgonio. 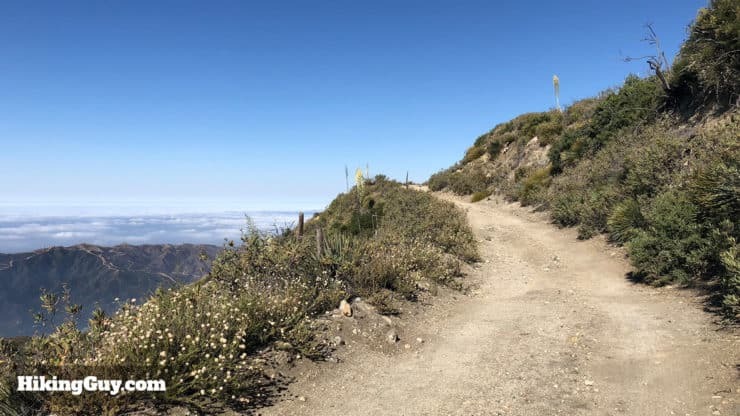 The summit has radio towers on it, but who cares, it’s still a great hike. 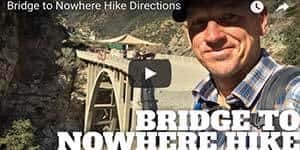 Where is the Mt Lukens Hike? 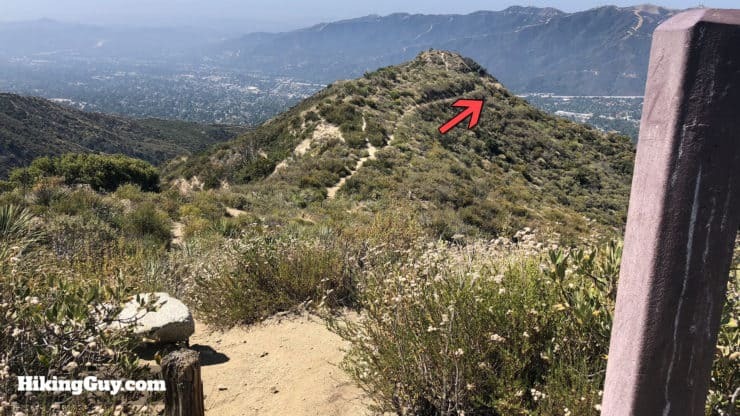 There are a few trails to the Mt Lukens summit, and this guide covers the most popular loop route from Deukmejian Wilderness Park, which is only 20 minutes from downtown LA (if the traffic gods are on your side). 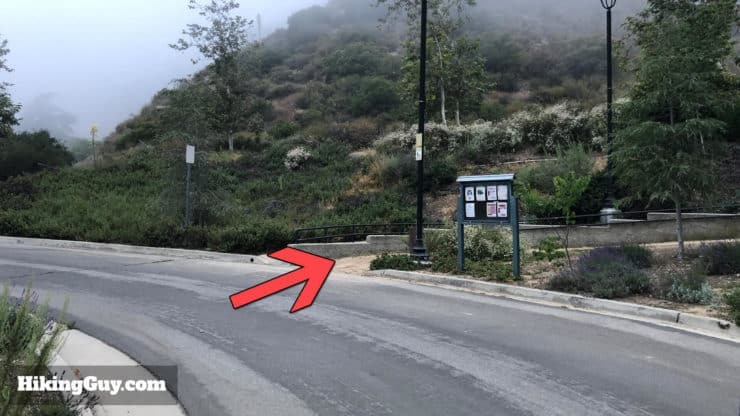 Use this trailhead address: Deukmejian Wilderness Park, 3429 Markridge Rd, Glendale, CA 91214. 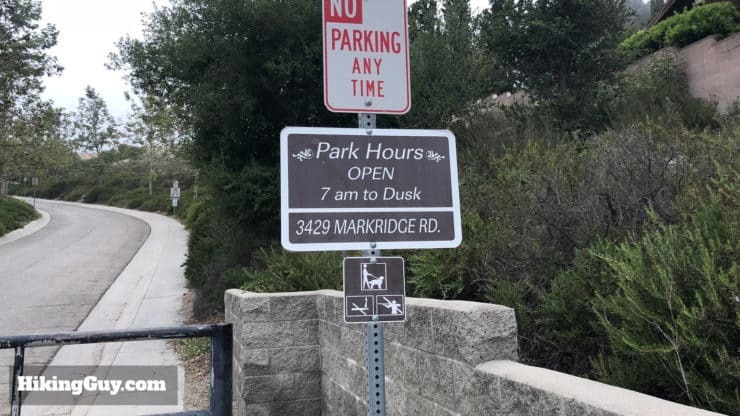 The park is open 7am to dusk. 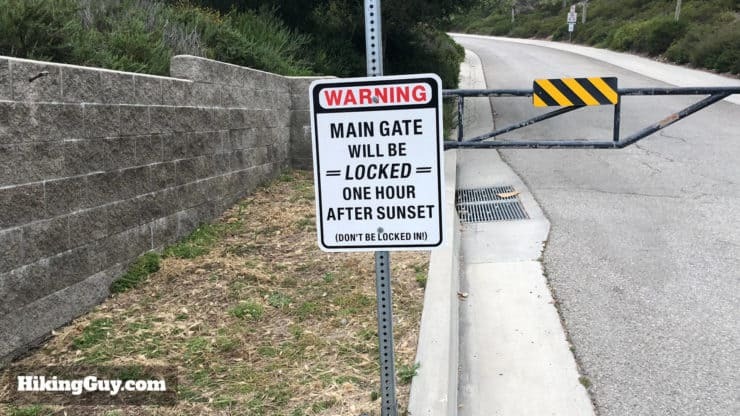 Some websites list different hours, but I can confirm that every time I’ve shown up before 7am the gates have been locked. 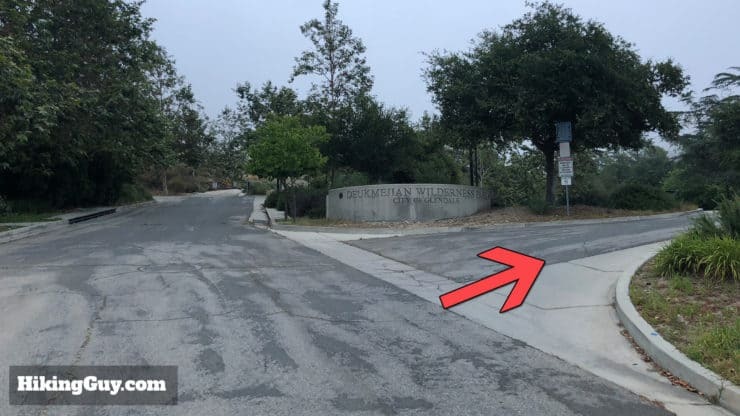 If the gates are locked or the parking lot at Deukmejian Wilderness Park is full, there is street parking around the entrance. Make sure you time your hike so that you’re back before the gates close. 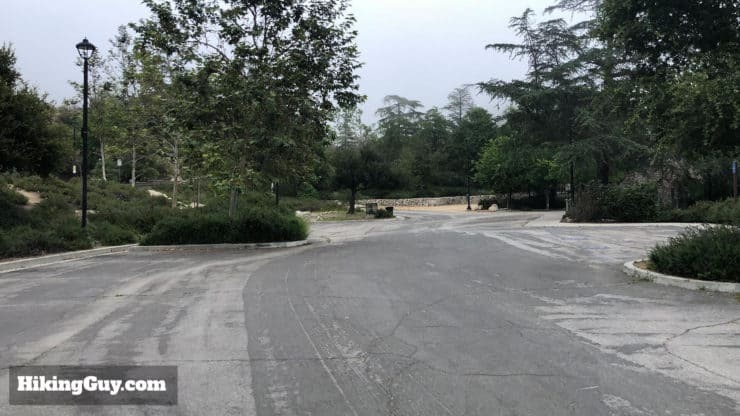 After passing through the gates, drive up the hill and bear right into the parking lot. The parking lot is a decent size but does fill up. There are water fountains to fill up your bottles and bladders. And bathrooms to empty your bladders. 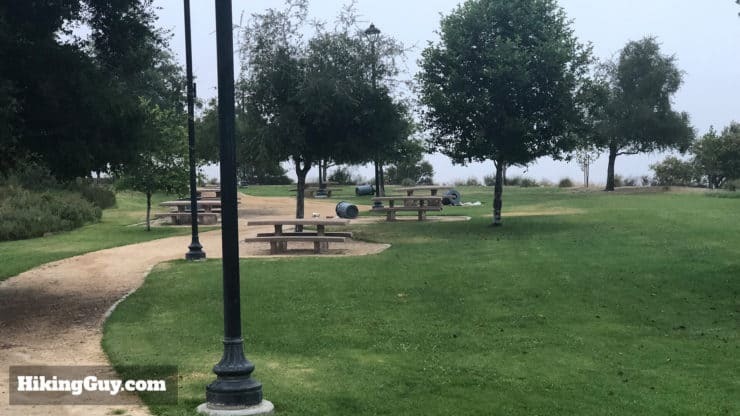 There’s also a cool little picnic area for a snack after your hike. I got here early when the coyotes were making their rounds on the trash cans. 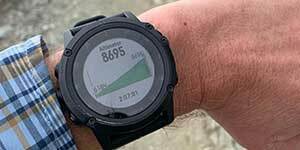 Although you could get away with doing this hike with fitness gear as many trail runners do, I strongly recommend using proper hiking gear. It’s a tough 10 mile hike and you need to be prepared. There’s also not a lot of shade so you’ll want to be ready for hot temperatures in the summer. 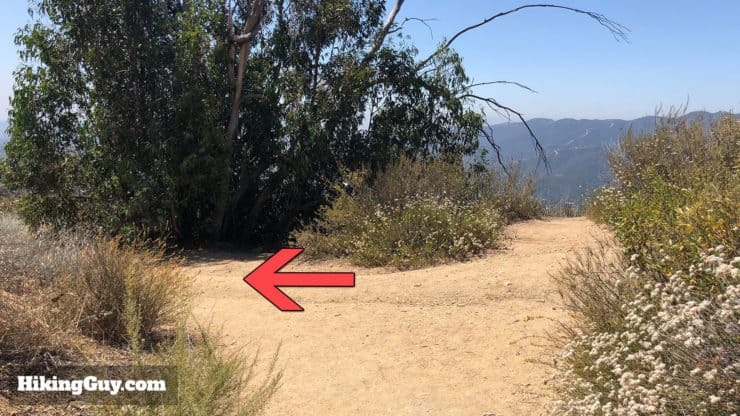 There are several trails and hikes to the top of Mt Lukens and as I mentioned earlier, this guide covers the most popular route which starts in Deukmejian Wilderness Park and makes its way into Angeles National Forest. 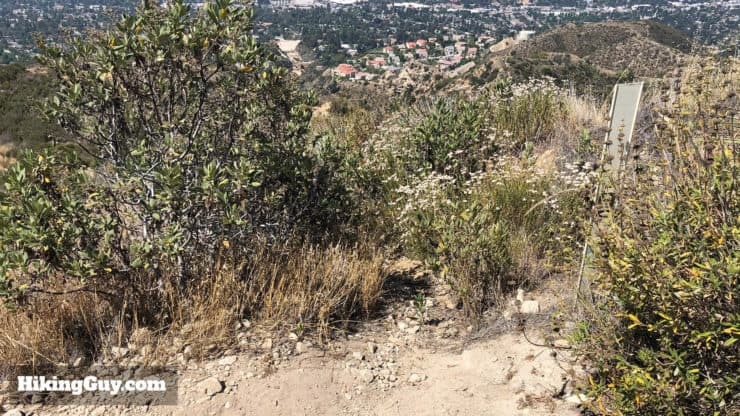 The hike heads up the Crescenta View Trail, visits the summit, then descends back to the start on the Rim-of-the-Valley Trail. Yea, it’s one of those hikes. You go up, and you come down. One thing I like about this routing is that the descent is a gentler gradient which makes it easier to enjoy the views on the way down. 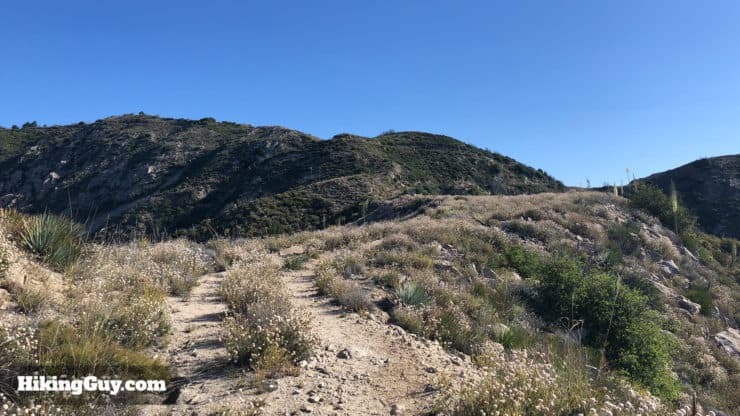 The hike goes counter-clockwise up the south side of Dunsmore Canyon, then after a visit to the summit, descends on the north side. 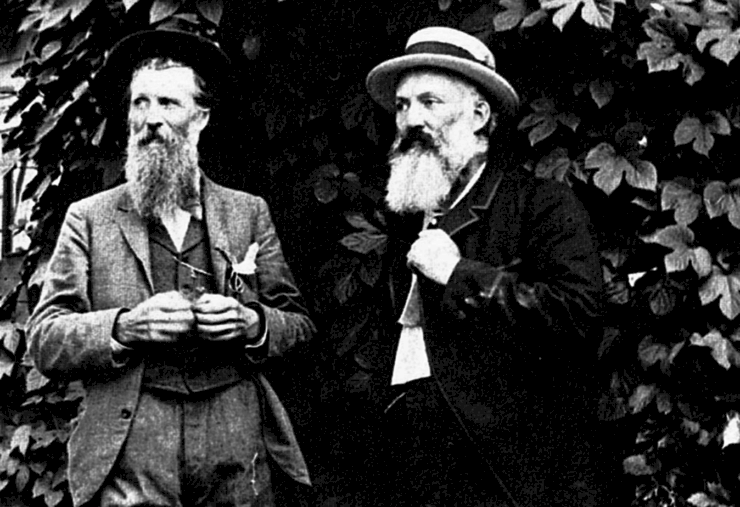 John Muir and Theodore Lukens, two guys who loved big beards.Photo Shirley Sargent. 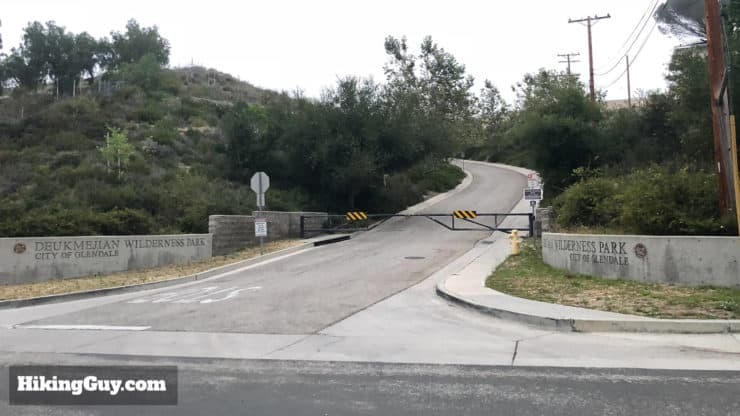 Mt Lukens is the highest point in the City of Los Angeles. 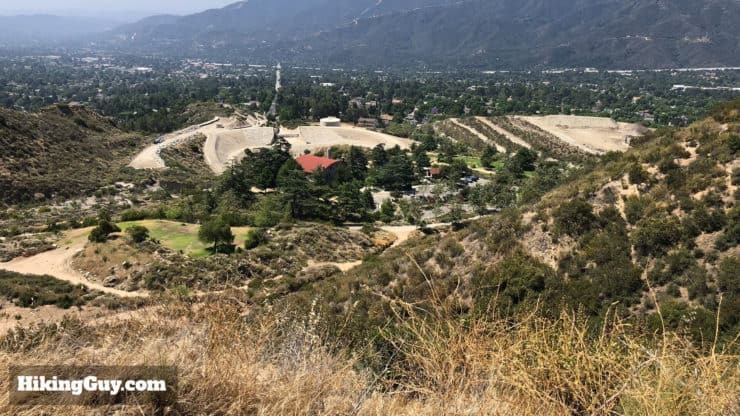 Mt Baldy is the highest point in the County of Los Angeles. 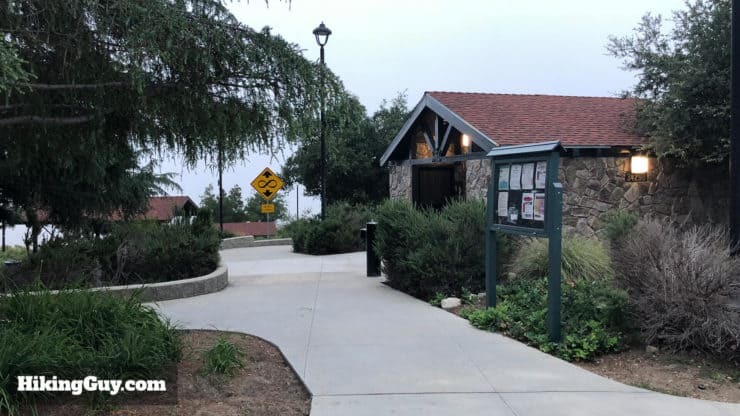 Its current namesake, Theodore Parker Lukens, was a Pasadena mayor and businessman who also had a love for the outdoors. 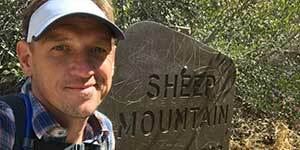 Lukens helped John Muir survey the Hetch Hetchy Valley in Yosemite and was a prominent member of the local Sierra Club. 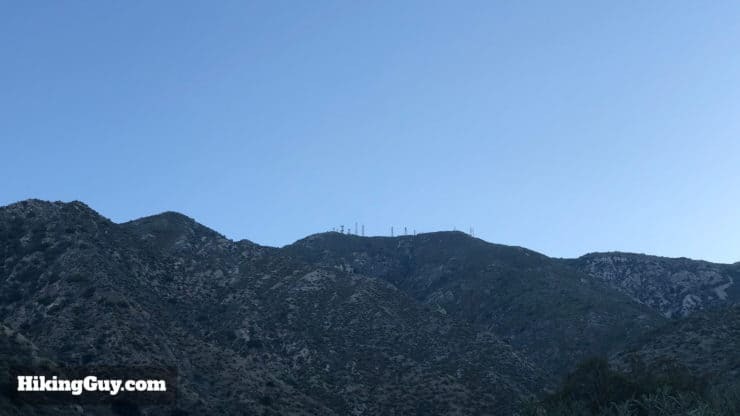 At the turn of the century the San Gabriels were showing the signs of abuse by miners, livestock, and loggers. 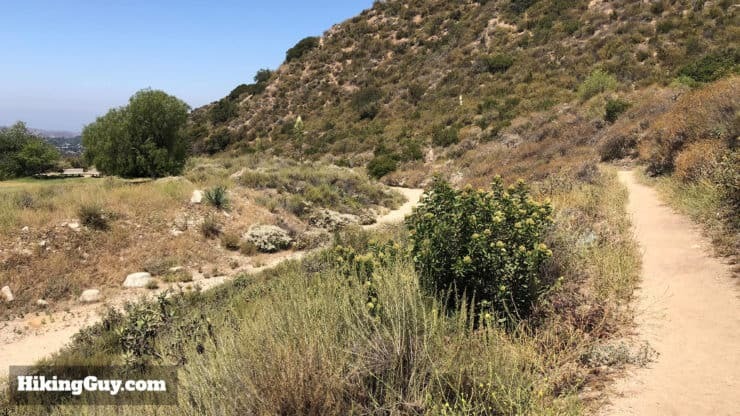 Lukens started a tree nursery at Henninger Flats with mixed success, but was noted as a prominent conservationist and advocate of the mountains around LA. 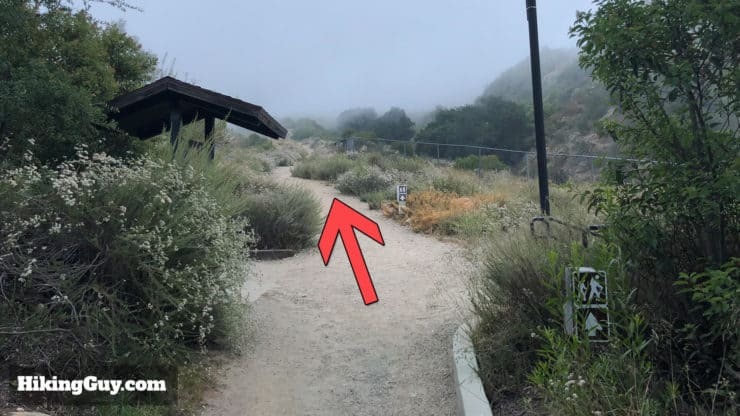 Deukmejian Wilderness Park, opened in 1989, is named after the former Armenian-American California governor (1983-1991), George Deukmejian. 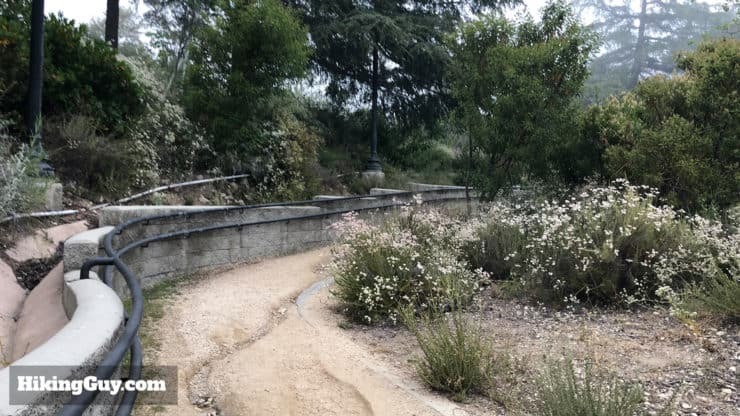 The park used to be home to one of LA’s top wine-producing regions. The large stone building that you see in the parking lot was constructed in 1914 as a barn at the center of George Le Mesnager’s vineyard, a French emigrant with an interesting history. 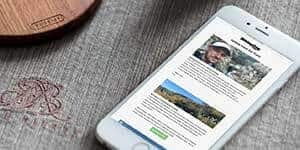 There are still vines here, and if you join the Stone Barn Vineyard Conservancy, you get to taste a bottle of the wine as part of your membership. In 2009 the Station Fire burnt much of the area that you cover on this hike, leaving only the radio towers standing. 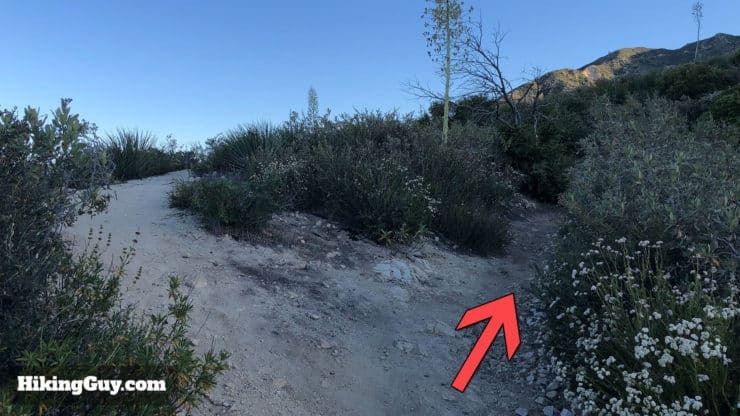 Although the chaparral has grown back, you can still see evidence of the fire on some sections. 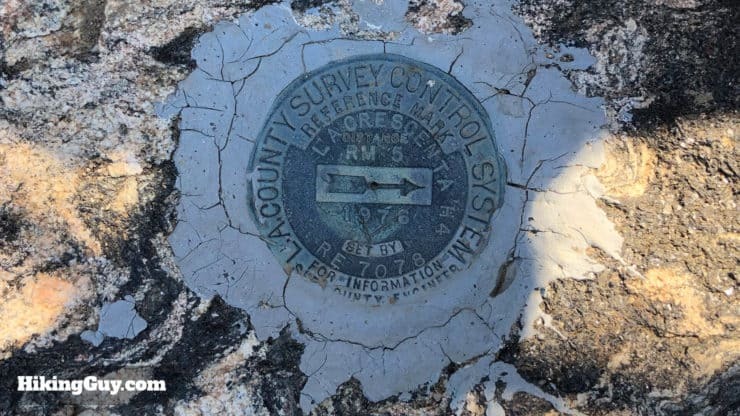 Keep your eyes open for evidence of the 2009 Station Fire. 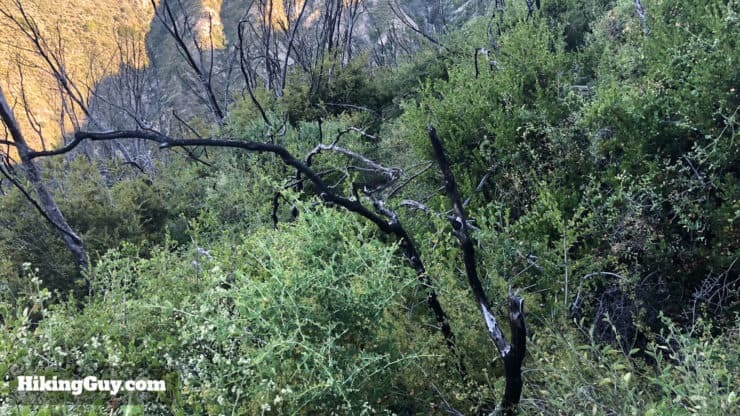 Here are some charred trees on the slopes of Dunsmore Canyon. 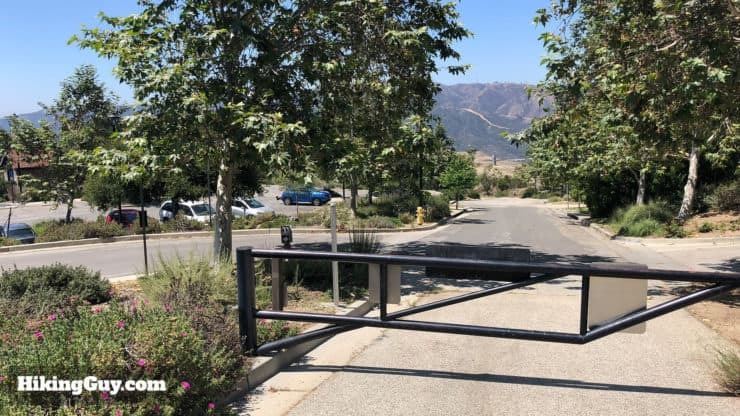 Finding the trailhead can be a challenge, there are a lot of paths around the parking lot. Head to the far end of the lot to start the hike. 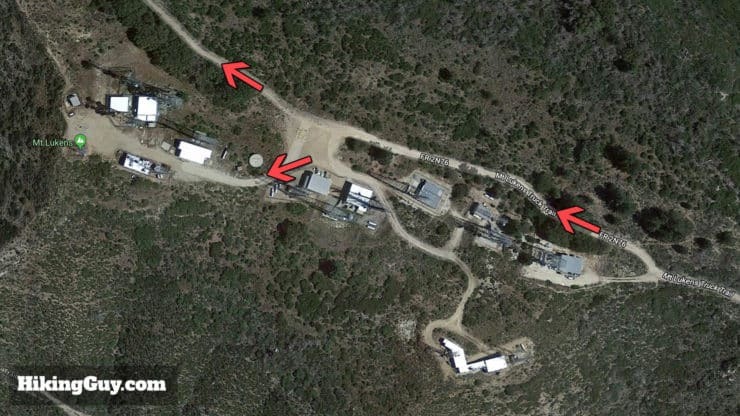 Here’s the trailhead as seen from the end of the parking lot. Hike up the walled path. 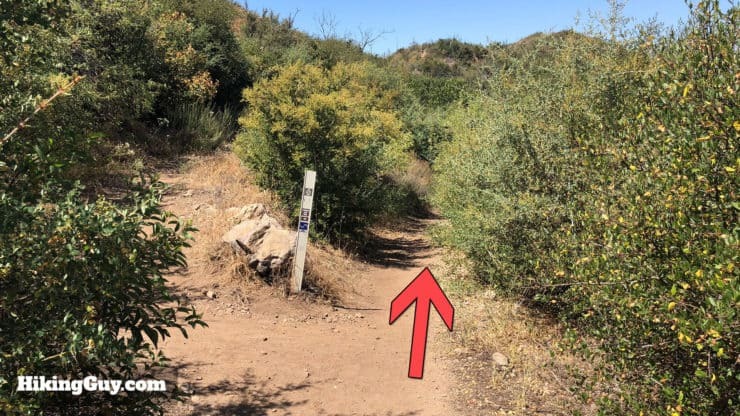 Go straight through the intersection with the trail sign. Keep heading straight on the path through this intersection. 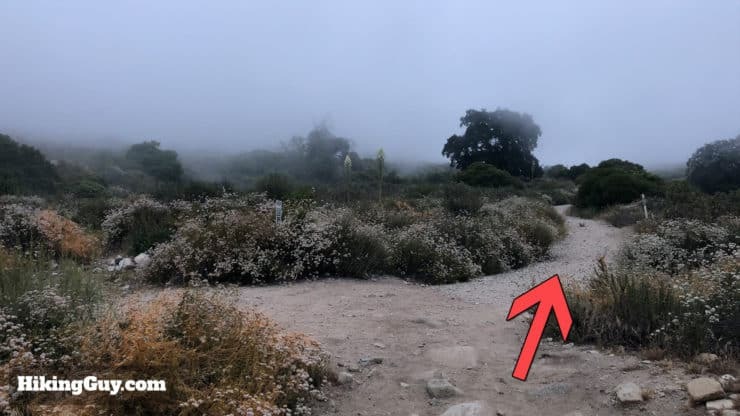 Soon after the last intersection, you’ll see a trail to the right marked the Vineyard Trail. Head down this trail. You’ll cross Dunsmore Creek, almost always dry but after big rains it can be impassable. If it’s been raining, call ahead. 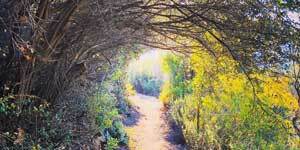 Head through the little grove of trees and bench to follow the trail. 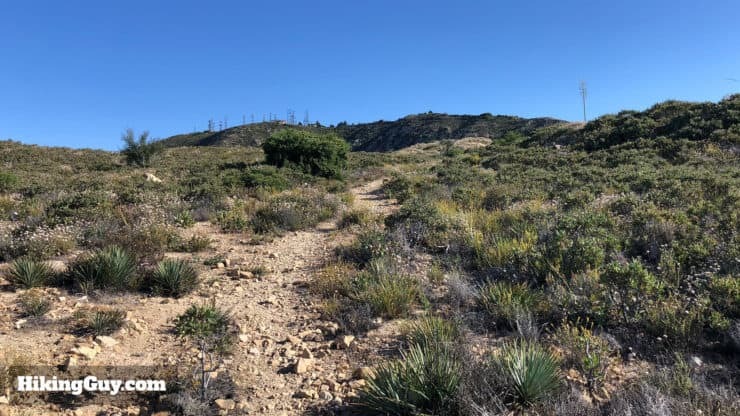 Soon the trail becomes more evident as you gradually climb up Dunsmore Canyon. 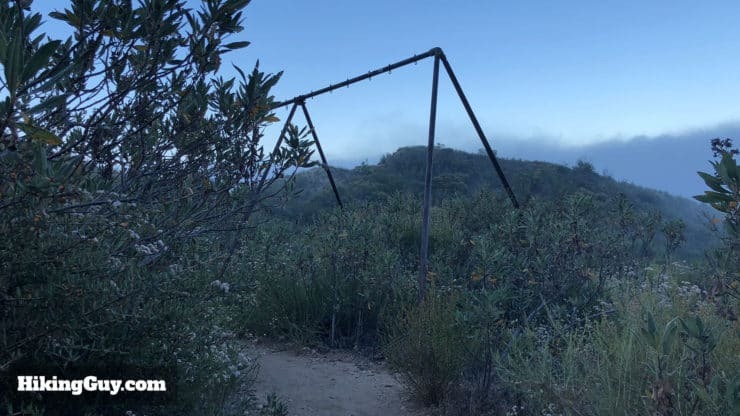 Keep your eyes open for an abandoned playground. It’s especially spooky when there’s morning fog. You’ll see radio towers on the peak above. That’s Mt Lukens. Only 5 miles of uphill to go! Almost there! 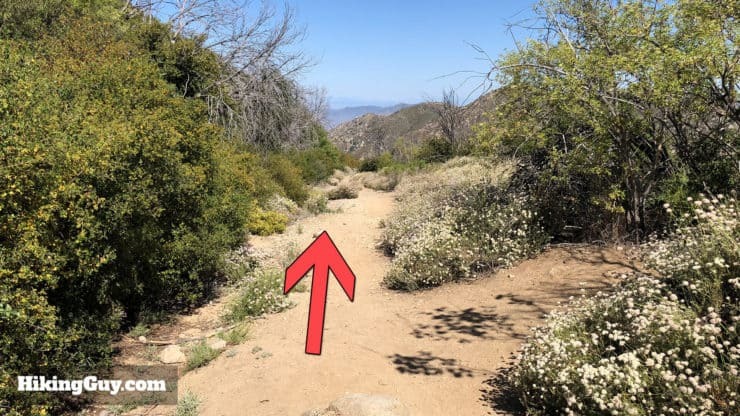 At the T-junction, hike right on the Crescenta View Trail. Now you start the real work as the trail climbs upward. 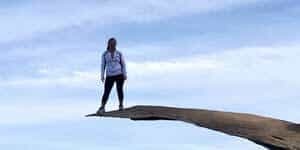 If you have an acute fear of heights, there are some sections along the side, but nothing out o the ordinary for most Southern California hikes in the mountains. This is about as bad as it gets. 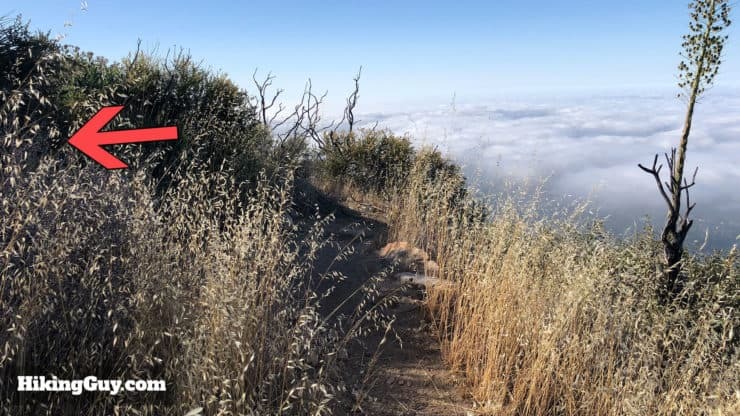 Take breaks and soak in the views of the Verdugo Mountains and the canyons below. 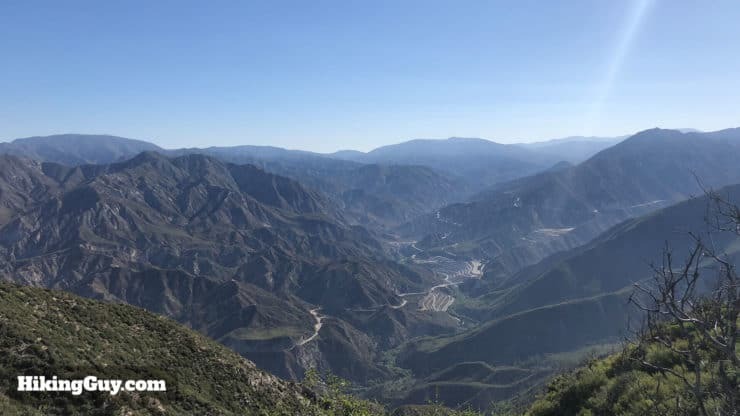 Here you can see the Rim-of-the-Valley Trail in the distance across Dunsmore Canyon, which you’ll be coming back on. 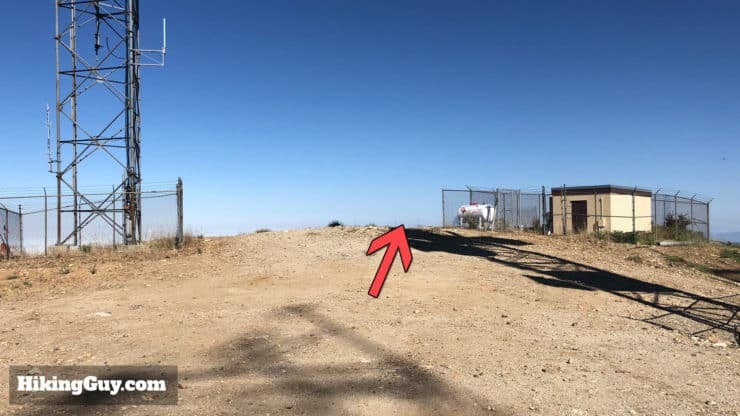 Stay right at this little cutoff for a viewpoint. 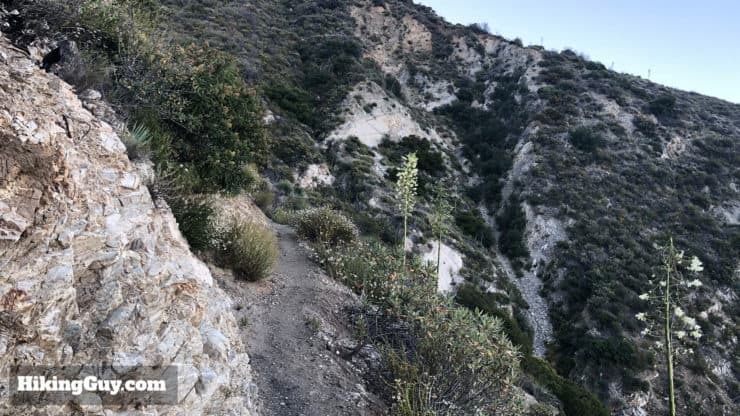 There a few places on the hike that have side trails to vista points. 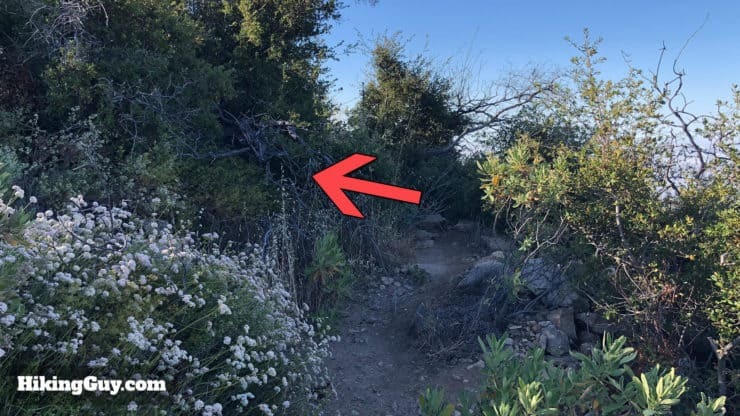 If you want to do some backcountry camping there’s a little windbreak along the trail about halfway up. 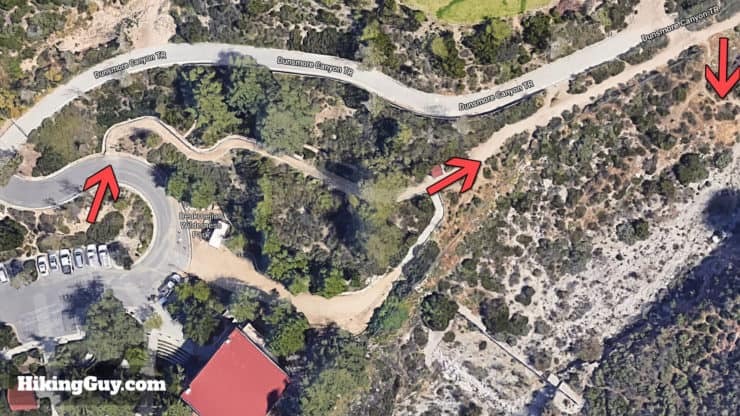 Some maps have a trail going straight here, and if you use any kind of auto-routing, it will probably have you going straight here. 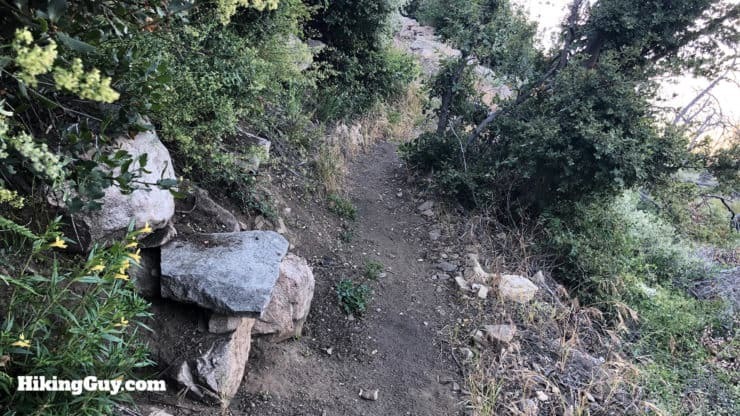 The only problem is that there’s not really a trail here, at least anymore. 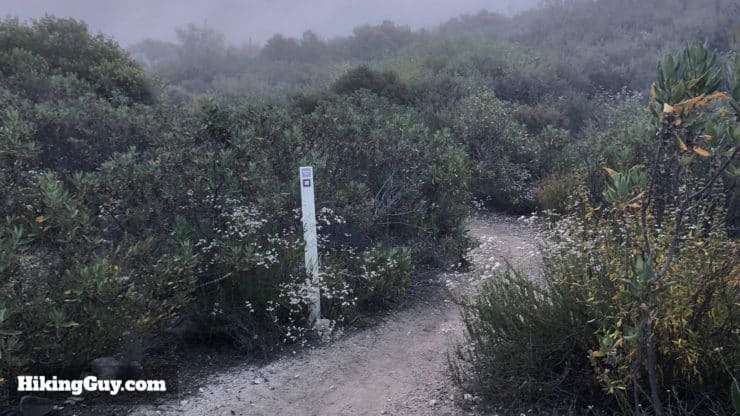 In general you’re going to avoid the dead trail and continue up the switchbacks until you reach the firebreak. Make the hard right and continue up the switchbacks. 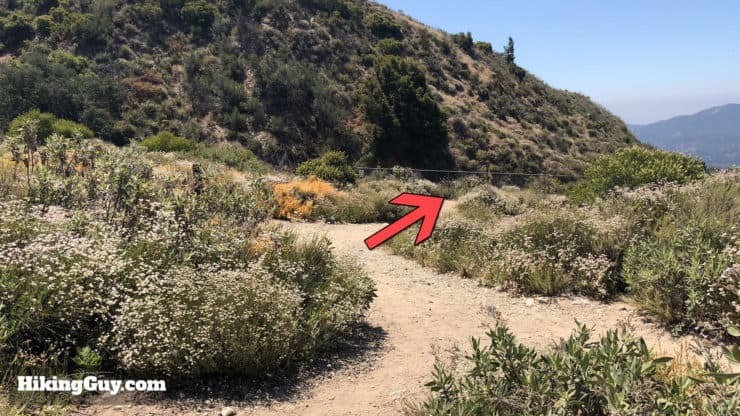 Avoid the (overgrown) trail that shows a route straight here on some maps. There’s a little stone bench after that last switchback to rest on. 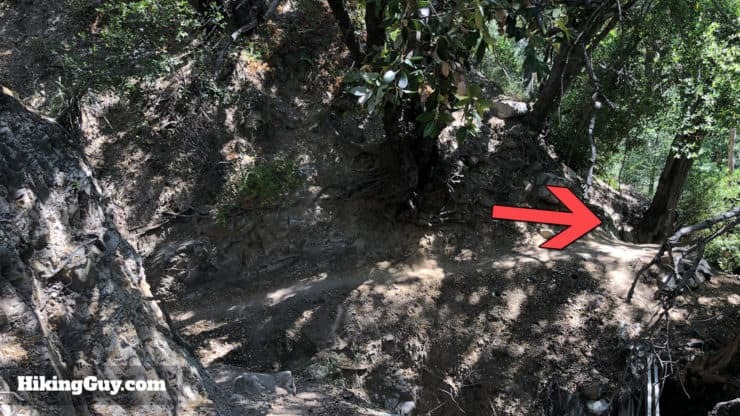 Make sure you cut back on the switchbacks and avoid any trails heading straight. You’ll get some nice views into Pickens Canyon, the next canyon over from Dunsmore. Stay left on the switchbacks. 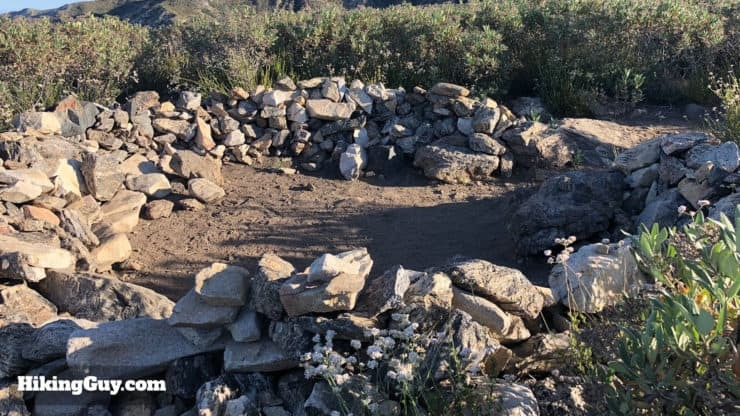 After the switchback section you’ll emerge onto Pickens Ridge. 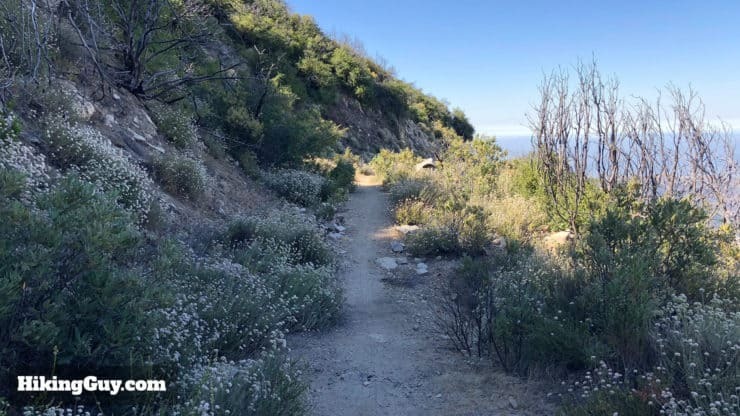 The trail follows a firebreak and offers a good place to catch your breath. 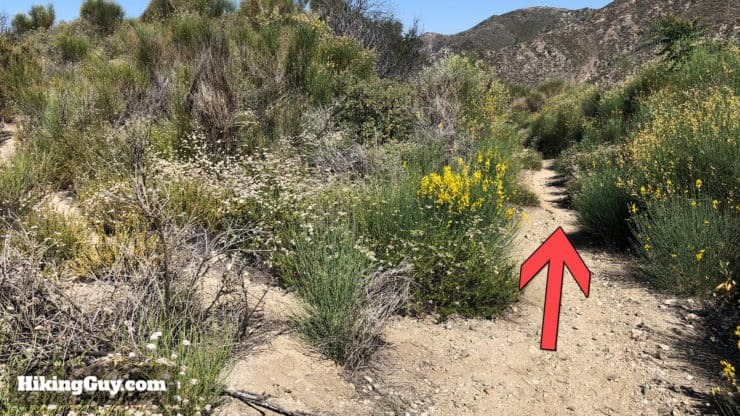 The firebreak turns into a primitive dirt road. Keep hiking straight. Almost there. Eventually you reach Mt Lukens Road. Make the left. 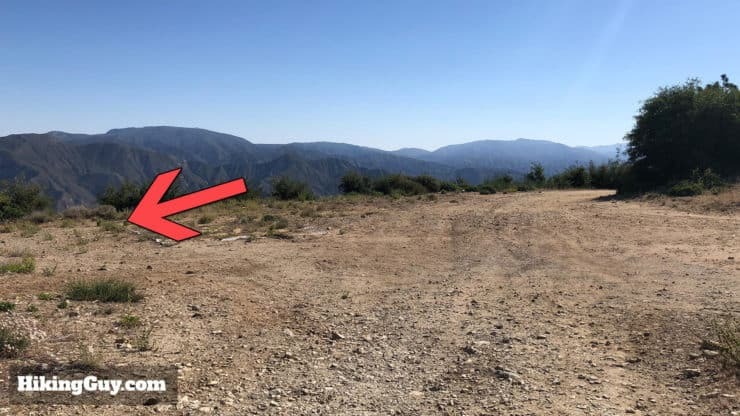 You get spectacular views into Angeles National Forest from Mt Lukens Road here. 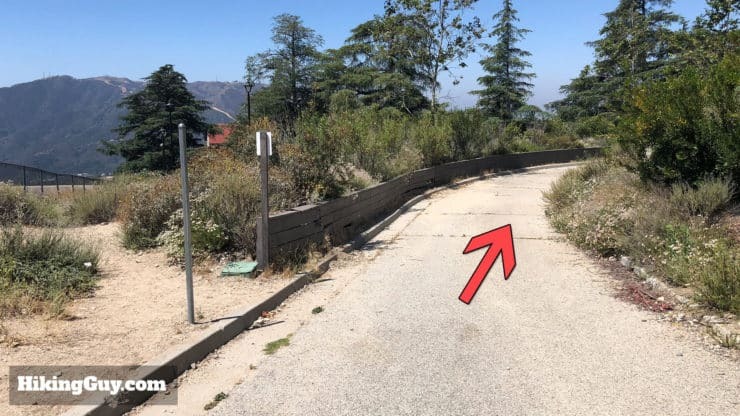 Notice Angeles Forest Highway and Big Tujunga Canyon Rd below. 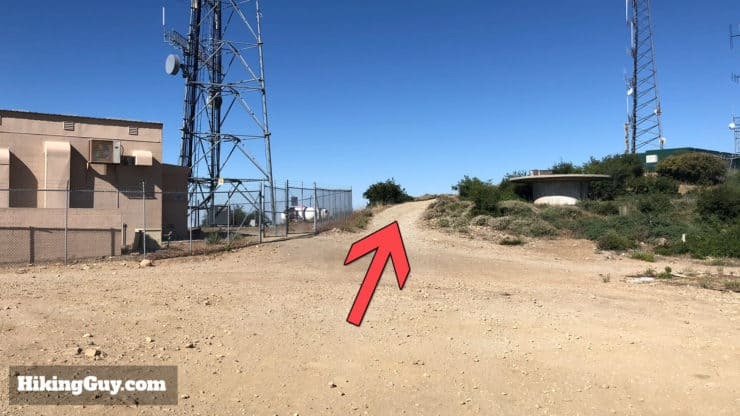 Keep going straight on Mt Lukens Road until you reach the radio towers. 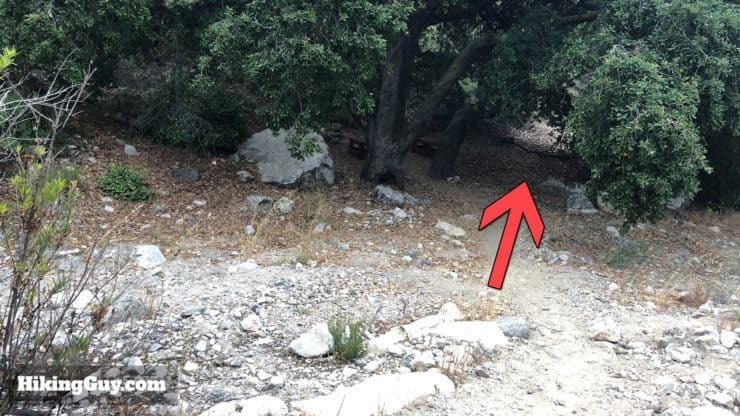 Keep your eyes open for mountain bikes. Here’s a map of the summit area which can get a little confusing. When you reach the complex of towers and buildings, hike straight through the intersection. 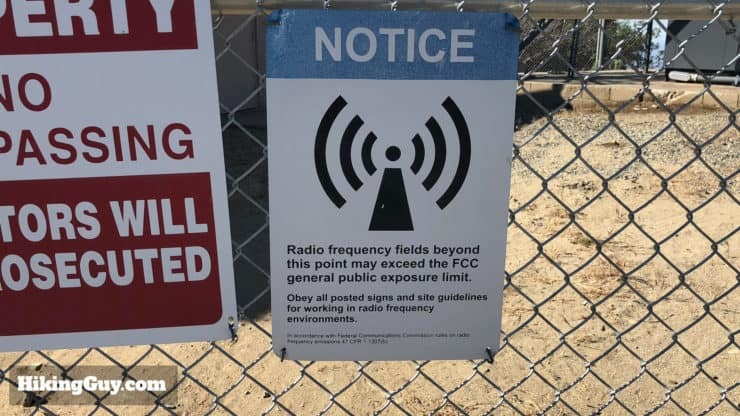 Don’t linger too long lest you get irradiated. Head behind the fenced in area for the peak marker and views. Soak in the views, and look to the NW to see the trail that you’ll be descending on shortly. The summit marker is embedded in a big rock behind the fenced in area. When you’ve had your fill of the summit, head back down to the intersection where the towers are and make the hard left. It can be overgrown here. Just head straight. And eventually the trail, Haines Canyon Road, becomes more evident. 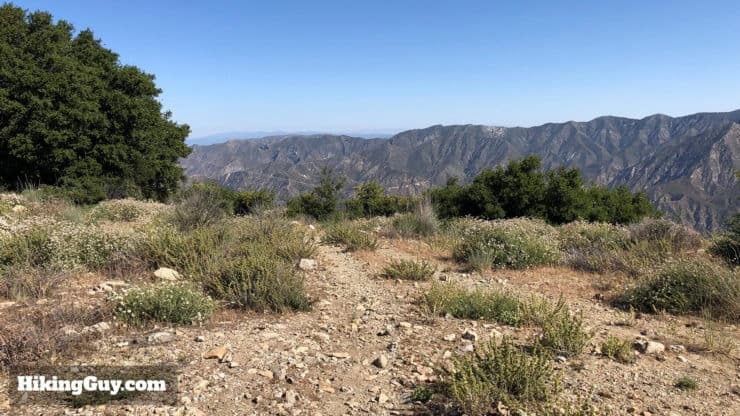 There are great views to the east into Angels National Forest here. Stay straight on Haines Canyon Road and avoid the Old Mt Lukens Trail to the right. 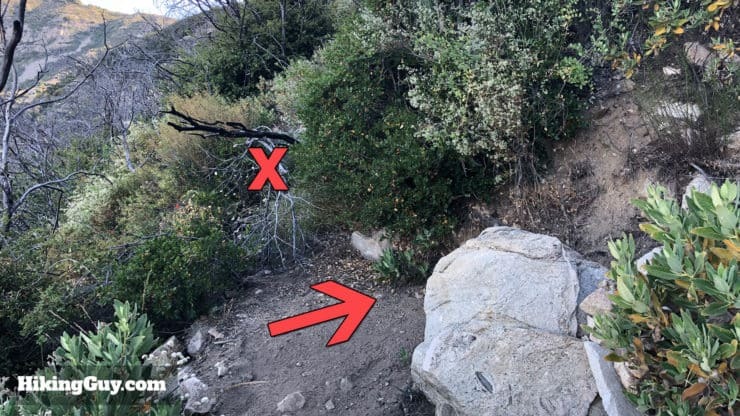 Avoid side trails to vista points unless you want a peek. 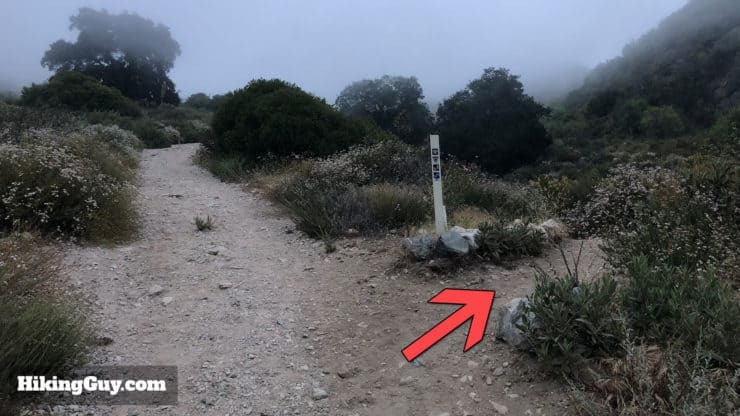 Keep your eyes open for this post, where you turn off left onto the Rim-of-the-Valley Trail. You’ll get a nice view of the Rim-of-the-Valley Trail unfolding below. Also note the vista spurs and cutoffs. 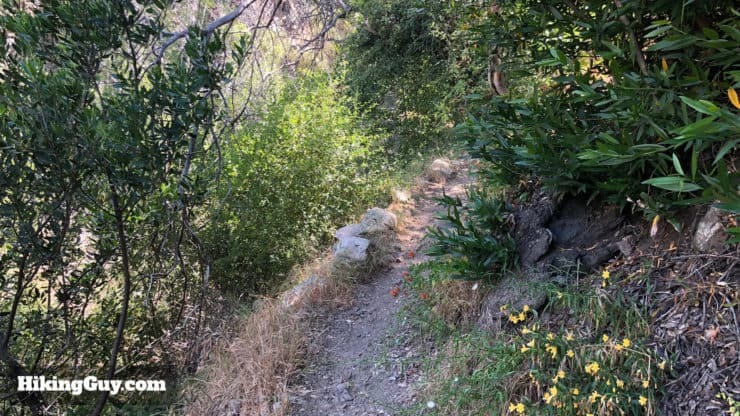 The main trail, while sometimes overgrown, is generally pretty gradual. 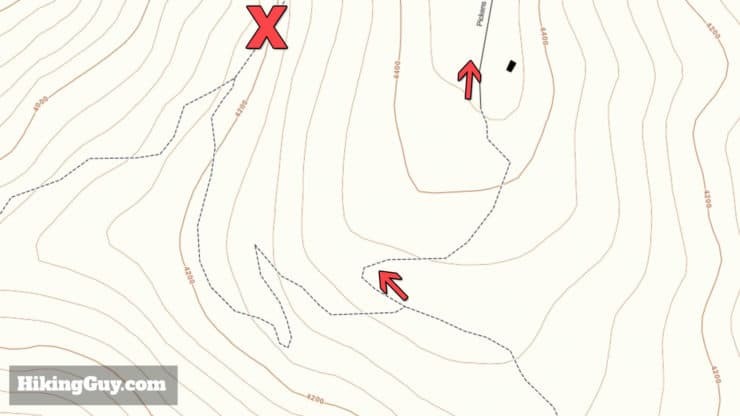 The cutoffs are generally much steeper and don’t follow the GPX. Follow the trail down the switchbacks. 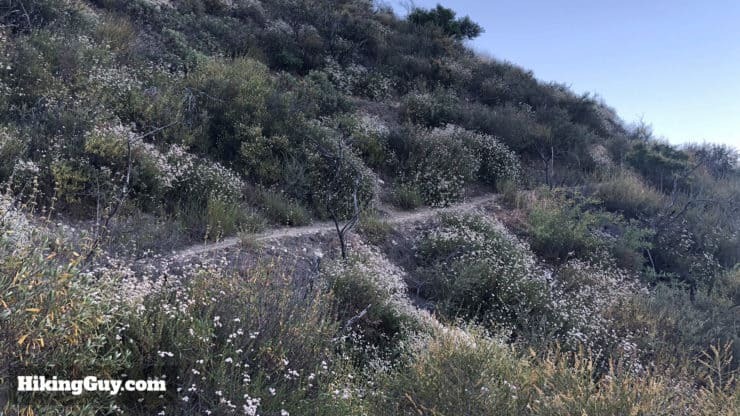 Some sections can be overgrown, so again, it helps to have a GPX on your device. 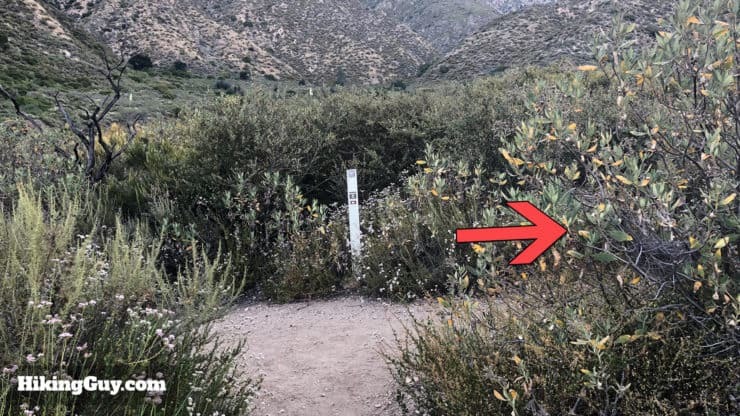 There are some minimal markers on the trail. Just go slow and keep your eyes open. 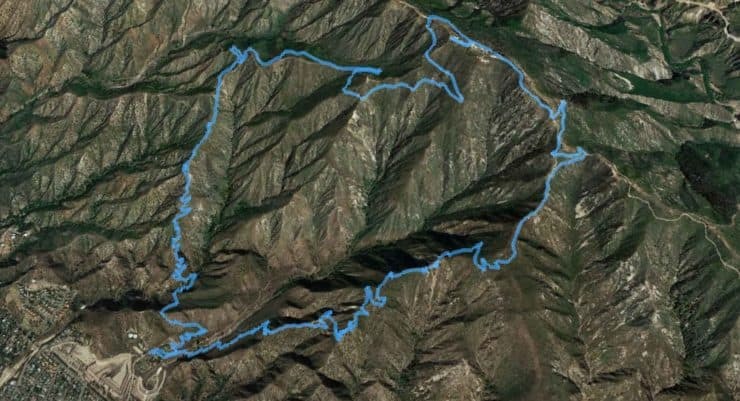 Towards the end of the descent you’ll come to a shaded area of Cook Canyon. Keep hiking through the shaded area along the stream. 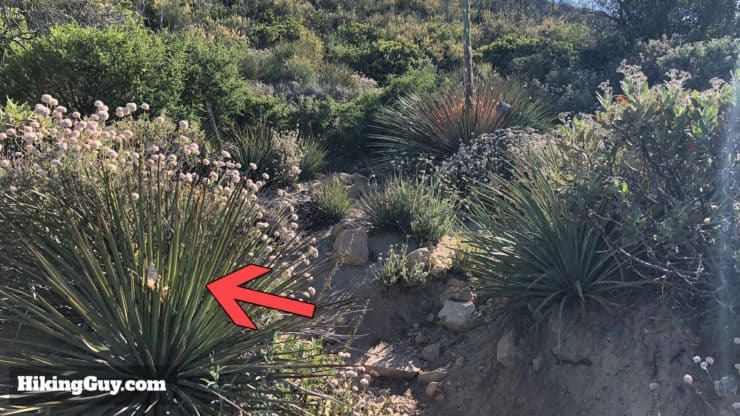 Watch out for poison oak. After the stream, there’s a little uphill section. After the last 9 miles and long descent, it’s an ouch moment. Almost there. The last section has some twists and turns. 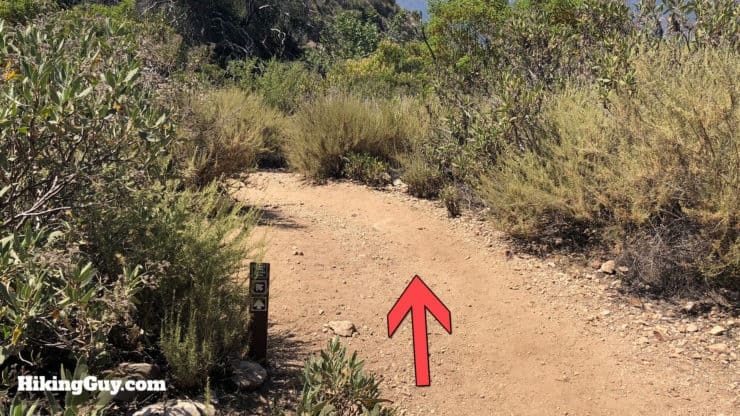 Stay straight and avoid the Le Mesnager Loop Trail. At the plateau, bear left. You’ll see the park entrance down to the right. Stay straight and avoid any little side trails. Continue around a sweeping turn by some picnic benches. The trail comes to an end, make the right. 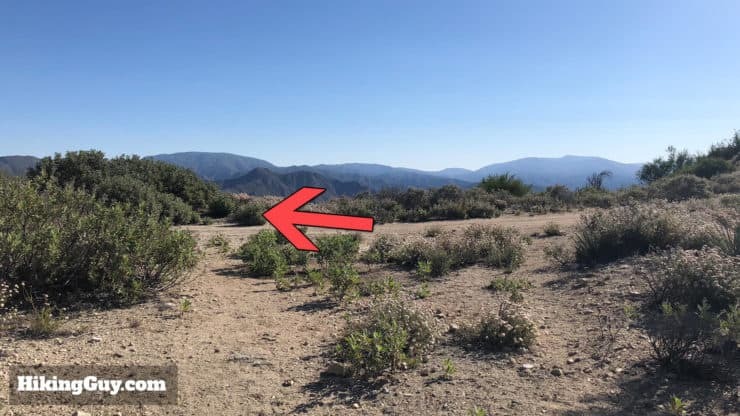 You’ll be on the paved road that you hiked up next to at the beginning of the hike. Head down toward the parking lot. And here you are, back at the parking lot. And that’s the hike.